Lookbook, Product Shots CD, Invitation, Press Releases and Gift Card created for the OFFICE Autumn/Winter Press Day, 2013. All elements designed and managed from concept to production and delivery. Lookbook, Product Shots CD, Invitation, Press Releases and Gift Card created for the OFFICE Autumn/Winter Press Day, 2013. All elements designed and managed from concept to production and delivery. The theme of the season hinted to a stripped-back, industrial feel, with trends such as Urban Army and Baker Street. The Press Day was to be held in the Vinyl Factory in Soho, with exposed brickwork and whitewashed walls, so to emulate this look and feel I wanted to use materials which highlighted this tough, raw and back-to-basics collection. 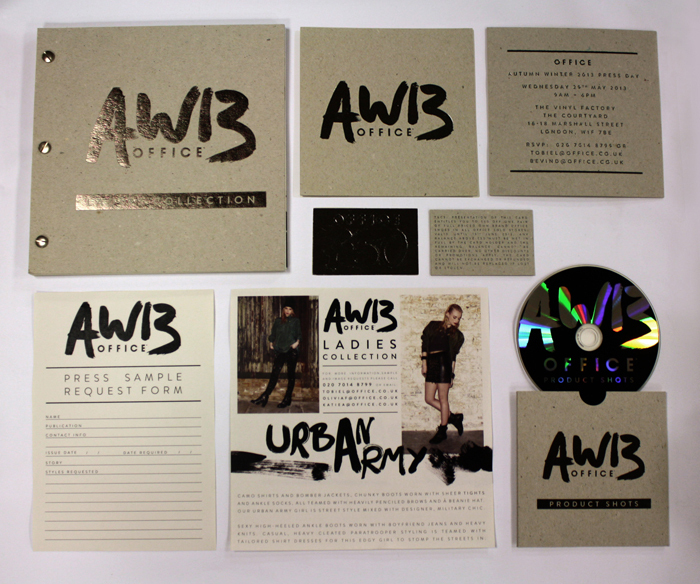 OFFICE AW13 Lookbook & Press Day Elements: Invitation, Gift Card, Press Releases and Product Shots CD. The gift card, CD wallet and invitation was also produced on Nomad board, with Luxor gun metal foiling on front and back. The Press releases were digitally printed both sides on 175gsm Cyclus. 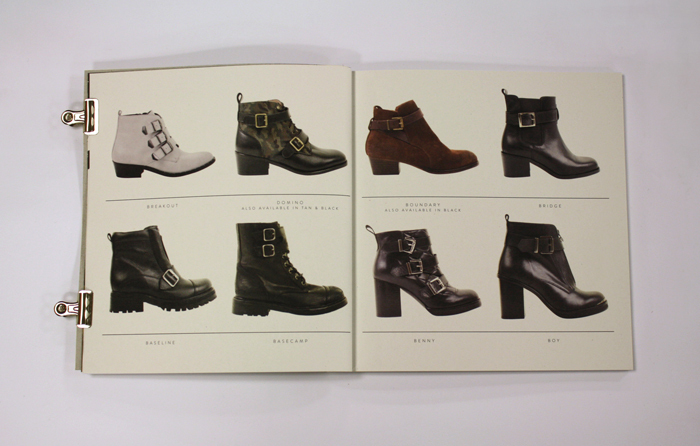 The Lookbook covers were produced on Nomad board, with Luxor gun metal foil on both sides, secured with chrome rivets. 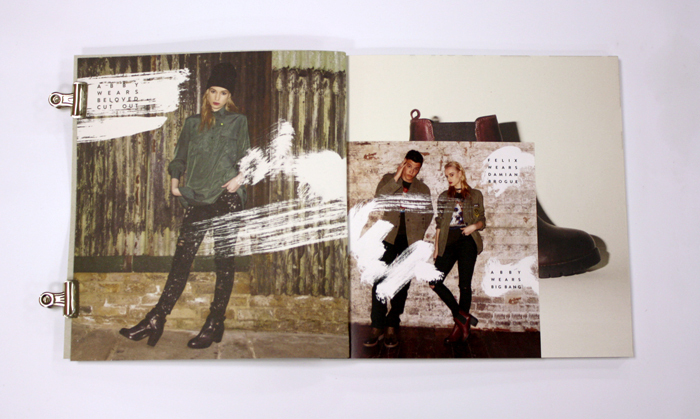 The lookbook was sized at 210mm x 210mm and produced on 175gsm cyclus, with smaller 150mm x 150mm gloss coated pages throughout, to highlight the campaign imagery. Lookbook and Gift Card created for the OFFICE Christmas 2013 Press Day. Similar specifications to the AW2013 Lookbook above, due to the product being from the same season, with a Christmas-feel update. The lookbook was sized at 150mm x 150mm and produced on 175gsm cyclus again; the smaller square size linking to the previous one. The covers were again produced on Nomad board, with a gold foil on both sides this time, secured with gold rivets. There was no campaign imagery available so gold foil was used throughout the book to highlight the trend names. The gift card was also produced on Nomad board, with gold foiling on front and back, and a gilt edging.